Decades of advice aimed at teenagers extolling the virtues of “staying in school” has had an unexpected effect. Too many people erroneously believed that advanced degrees were the best (and only) way to get a high paying, secure, and rewarding career. While university degrees certainly have their place, this trend has led to certain job markets becoming oversubscribed, and it is instead the realm of skilled trades that is sometimes the most sensible, though less obvious, choice for young people today. A skilled trade does not necessarily mean manual labor. And, though a skilled trade rarely needs an advanced degree, moderate-to-long-term training is usually required. This can be in the form of ongoing courses, on-the-job training, or apprenticeships. Manufacturing — industrial machinery mechanics, welders, CNC machine tool programmers, etc. Health care — dental assistants, pharmacy technicians, home health aides, etc. Agriculture — butchers, landscapers, tree trimmers, food batch makers, etc. Energy — plumbers, electricians, environmental engineers, HVAC mechanics, etc. IT — computer programmers, network support specialists, computer user support specialists, etc. Great pay — Advancing in a skilled trade can see you quickly earning big money. For example, the median salary of a chef is $45,950, a CNC machine tool programmer $52,550, and a plumber $52,590. Little-to-no debt — While the cost of a bachelor’s degree in the U.S. averages around $127,000, a trade school degree costs approximately $33,000. You can also get to earning money quicker, so any loans you do need to take out could be repaid before your university-attending peer has even finished their study! Job security — There are more than 8,000 skilled trade jobs available today, and that is just in Michigan. A skilled job generally means you’ll always have somewhere to work. Another benefit of choosing a skilled trade is the number of ways you can go about getting into the workforce. Starting from middle school, you can begin to identify what you’re good at and what you think would be the most interesting career path to pursue. When you have an idea of the general trade you want to ply, you can begin to investigate the best routes into it. You might go straight into the job with craft training or an industry apprenticeship. Alternatively, you may first go to a technical school, community college, or technical college before beginning an entry-level position or industry apprenticeship. The goal with trade work should be to hit the ground running so you can make your way to being a craft professional and potentially earning $30-60k (depending on your chosen industry). The next opportunity for advancement, given further training and experience, will typically be to a leader/foreman position where you’ll be earning $60k-$160k. From there, you could consider becoming a superintendent, project manager, senior management, or CEO. The path of trade work is clear, and if it makes sense to your skill set, interest, and future, it is yours to take. Instead of spending over $100,000 to go to a university only to find yourself on the bottom rung of the employment ladder, or working in a field that leaves you feeling unmotivated and uninspired, you’ll be getting paid to learn the skills of your trade and gain valuable experience. It is after all our “experience” that employers care about the most when it comes to hiring. If you (or your child) is seriously considering the alternative route of trade work, but are uncertain where to start searching for opportunities: there are so many schools, programs, and apprenticeships in Michigan that you are actually spoiled for choice. Let’s take a look at a few. The State of Michigan’s Going Pro site discusses the requirements, wages, demand, and intricacies of all the skilled trades you’ll find in Michigan. It’s a good place to peruse when first choosing your career path. Blast Detroit offers pre-apprenticeship programs to get you ready to meet the entry requirements of apprenticeship programs. MI Apprenticeship is building awareness of on-the-job training mentorships that are paid for by the employer. Graduating high school or obtaining your GED is a prerequisite. Michigan Works runs over a hundred one-stop service centers that you can visit in Michigan. At these locations, you can talk to someone in person about how best to realize your skilled trade dream and discover open positions from leading employers. Greater Michigan Construction Academy is an example of a vocational school that specializes in a particular skilled trade sector. In this case, you can train to become a construction craft workers, foreperson, supervisor, and beyond. Registered apprenticeships are available for on-the-job supervised training. Typically, you’ll complete 8,000 hours of training on the job paired with 576 hours of classroom training over four years. Michigan Advanced Technical Training is an apprenticeship program with classroom instruction paired with on-the-job training. It is a three-year training program where all tuition costs are paid for by the employer, there’s on-the-job training with pay, and you’ll come out the other side with a guaranteed job and an advanced Associate’s degree. You must commit to two years on the job. Jackson College has a wide range of courses in skilled trades. From electronic technology to automotive service, from advanced manufacturing to aviation flight technology, you can learn it all here. The cost is tuition is around $5,000 a year, but additional cost for books and service fees will apply. Financial aid and scholarships are available. Further apprenticeships across all industries are listed at the Department of Labor Employment and Training Administration and at MI Road 2 Work. Consider your options carefully, think about what you’re good at and what you love to do. 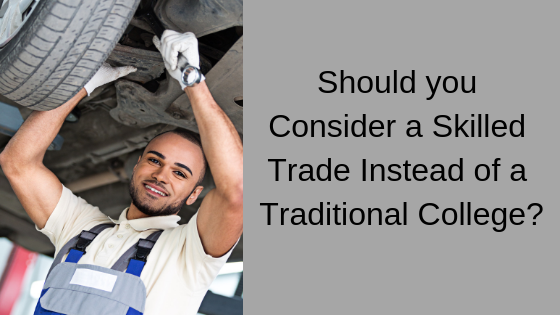 A skilled trade may be the best option for a long and fruitful career.